I kinda got tired of slacking so much, is not fun anymore… And not only with my own projects (which is kinda to be expected, as they are usually just too big) but also when just doing something as simple as a new version of an existing map like is happening with Mako Reactor right now. It should just be a quick fix (specially since I got some people helping me) and for some reason is taking me forever… So that’s it, I give up, I quit. Enough wasted time. So that’s it. I quit mapping for CS:S and starting today I will do something completely different for a change, a new and fresh thing that I expect is going to way easier and less time consuming to work with and is completely unrelated: mapping for CS:GO! So far, since the cannon is the most prominent part of the map, and cosmetics are all over the place this days, I was thinking of naming it something in the lines of “Cosmetic Cannon“, but I don’t like the name origin being so blatantly obvious… So then I thought about changing it to “Cosmo Cannon” (is shorter and easier to pronounce, and some people may relate it to the cosmos)… But then, since I didn’t want to spoil people in the name that there will be a cannon, I thought about throwing a curve ball and miss-spelling it on purpose as “canyon” so they expect a canyon instead of a cannon. Any thoughts on renaming it “Cosmo Canyon” as to avoid any relation with FFVII? Anyway… That was it. Sorry for the inconveniences and false promises. See you next week! I will try to take some photos of Cosmo Canyon for you guys! EDIT: Some people are telling me they are getting an error link… Dropbox fails sometimes, and seems to fail more with big sized archives… Try again later, or wait to see if Hannibal manages to upload to Gamebanana. Thats it folks! Hannibal made it! We had been really busy testing the map for the past two days and we think that its bug free so far and ready for the servers! (At least we couldn’t find more bugs on Lan-Test, probably some will appear after playing it in the real online servers). 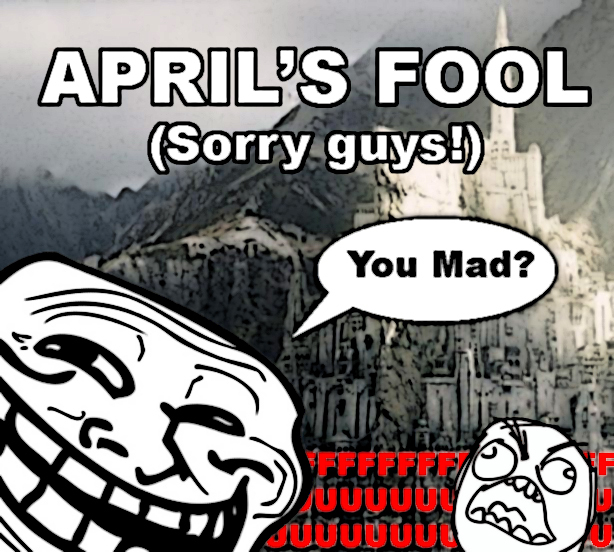 On the picture, from left to right: us troling you, you getting troled. The map itself it’s quite big (223 MBs!) but its full of models, customs textures, sounds, music; and its a really big map itself (in walkable size and details). Right now Hannibal is trying to upload it to Gamebanana, and I will edit this rant with the link as soon as possible; but you know that Gamebanana bugs sometimes, specially when uploading big files. For the moment you can use our Dropbox download already! We hope you all enjoy the latest map from the creator of Mines of Moria, Mount Doom, Helm’s Deep, Paranoid and Mako Reactor!